Print and Digital Editions available through MagCloud.com. If you are a Zinio user you can purchase one issue or subscribe by clicking the Zinio banner below. 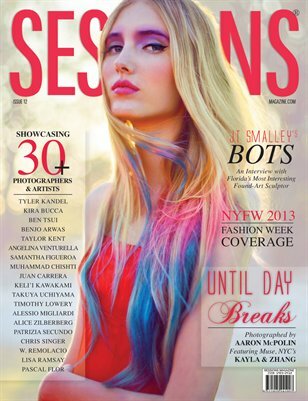 SESSIONS Magazine Issue 12 features more than 30 photographers and artists from around the world, including photography from Tyler Kandel, Ben Tsui, Kira Bucca, Paul Buceta, Tomokazu Hamada and a series from Taylor Kent featuring ANTM S16′s Hannah Jones. Also featuring an interview with found-art-sculptor JT Smalley. Cover photography by Aaron McPolin.